One tool, four different ways to merge multiple Excel sheets into one. You just specify how you want to combine spreadsheets, and let the Copy Sheets add-in do the rest. What used to be a daunting task for many Excel users is now a simple few-clicks operation. No more copying and pasting, no more manual re-entry of data, no more errors. Copy sheets in each workbook to one worksheet This option will turn your workbooks to sheets and collect all the resulting worksheets in one workbook. 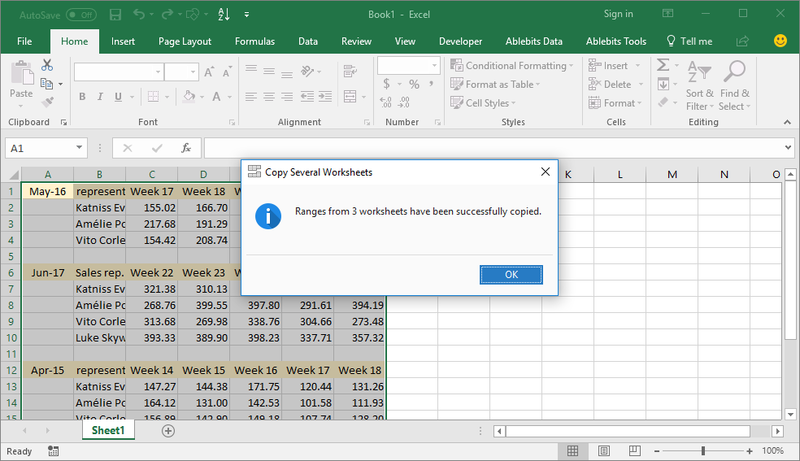 Copy selected worksheets from several workbooks to one file Collect all the needed sheets from different Excel files to one new workbook in a couple of clicks. Choose ranges to copy Whichever merging option you use, you can choose not to copy the whole sheet, but only particular ranges. Be sure your new books are always up to date Tick off Create links to source data if you want the result tables to be updated automatically when the source data is changed. Combine data from selected sheets into one Create one table with data from multiple sheets. Place the copied ranges one under another or side by side. 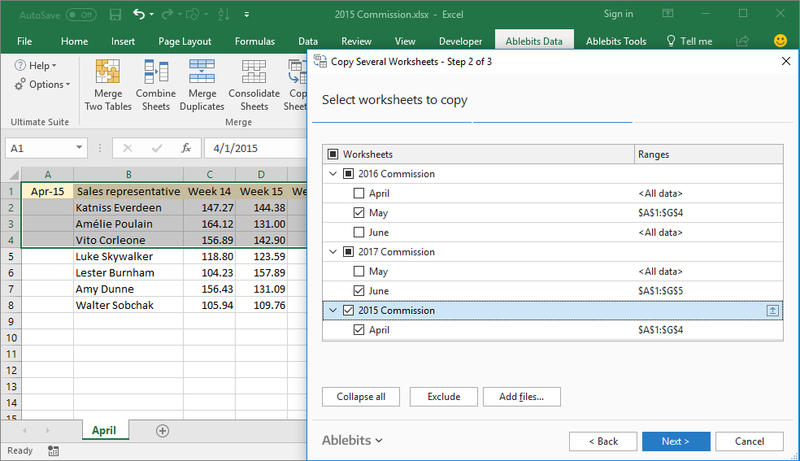 Merge data from the identically named worksheets into one Merge several Excel files into one by combining worksheets with the same name into one sheet in a new workbook. Paste values only Select this option if you don't want to copy formulas, but rather replace formulas with their calculated values. Preserve formulas when merging data If your copied ranges contain formulas and you need to preserve them in your new workbook, just tick off Paste all. Copy sheets in each workbook to one sheet. Place the resulting worksheets to one workbook. Combine data from the selected sheets with the same name to one sheet. Merge data from the selected worksheets to one sheet. What is Copy Sheets and what do I need it for? Copy sheets is an add-in for Microsoft Excel that simplifies and expedites the process of combining data from different worksheets and workbooks. Copy sheets in each workbook to one sheet and have all the new tables in one file. Merge values from the identically named sheets in different workbooks to one sheet. Create a new workbook with only selected worksheets from different books. Collect data from the chosen worksheets to one table. There is a build-in command Move or Copy Sheet, which is sufficient if you merge sheets from one workbook. In case you have many workbooks and need to copy sheets from each of them, working with Move or Copy command will be rather time-consuming. With Copy Sheets you can copy tables from different worksheets and workbooks simultaneously, so the more books and sheets you have, the more working hours will be saved. Excel Consolidate feature can be helpful to pull together data from several worksheets, but it works for numeric values only and you have to choose the function: sum, count, average, etc. If you need to merge data by just copying values, the consolidation option won't help. Of course, you can always use copy-pasting, but again, it is great for a little number of sheets and books, but could be rather wearisome when you have dozens of them. How does Copy Sheets work? 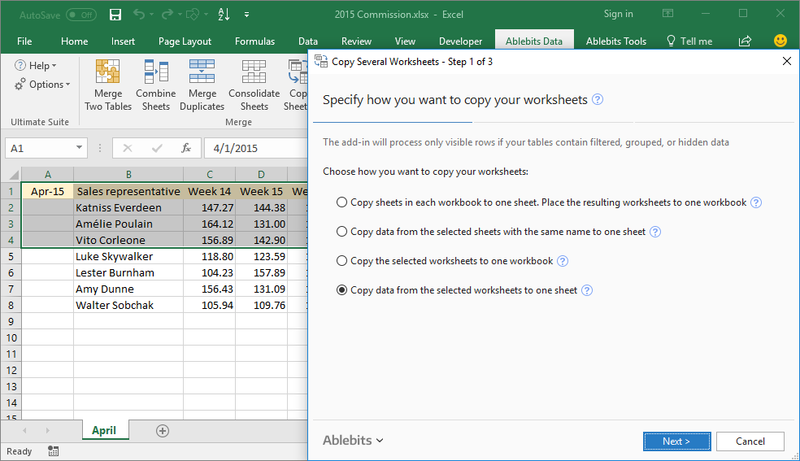 On Step 2 you select the worksheets, workbooks and ranges to copy. You can add any Excel files to the list. On Step 3 you choose how to paste data (paste formulas or values only, create links to source data), how to place the values (to columns or to rows), and how to copy data (preserve formatting, separate the copied ranges by a blank column, copy table with their headers). You click Copy button and in a couple of seconds get the new workbook with all the copied ranges. Can I choose range for copying in the selected sheets? Yes, from each sheet you can select a certain range for copying. My data has formulas, will they be copied as well? All your formulas will be preserved if you tick off Paste all option. I've got links in my copied ranges, can I preserve them? Yes, tick off Create links to source data to save your links. How can I separate the copied data? The copied ranges can be separated by blank columns or rows.